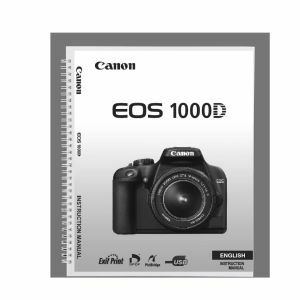 A black-and-white reprint of the original instruction book supplied for your Canon EOS 1000D camera. Professionally produced as a high quality, spiral bound A5 book. A black-and-white reprint of the original instruction book supplied with your Canon EOS 1000D camera (sometimes only supplied online as a downloadable PDF guide). Finished book size is A5 (148 x 210mm). Our reprints are high quality, printed on 80gsm super-white Canon paper on a Canon office copier. The pages are then spiral bound with a clear acetate front cover and red card back cover, held together with a strong white wire. Your manual will lay flat when open and will last for as long as your camera, with a little bit of care. Manuals over 400 pages long may be supplied as more than one book – this is because the wires we use to bind only hold a certain number of pages.